The ten principles below are based on the hundreds of squares--the good and the bad--that we've analyzed and observed since then. What stands out most is that design is only a small fraction of what goes into making a great square. To really succeed, a square must take into account a host of factors that extend beyond its physical dimensions. A popular square in Copenhagen, Denmark. Historically, squares were the center of communities, and they traditionally helped shape the identity of entire cities. Sometimes a fountain was used to give the square a strong image: Think of the majestic Trevi Fountain in Rome or the Swann Fountain in Philadelphia's Logan Circle. The image of many squares was closely tied to the great civic buildings located nearby, such as cathedrals, city halls, or libraries. Today, creating a square that becomes the most significant place in a city--that gives identity to whole communities--is a huge challenge, but meeting this challenge is absolutely necessary if great civic squares are to return. 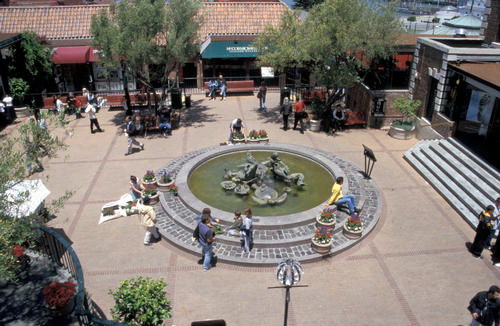 Any great square has a variety of smaller "places" within it to appeal to various people. These can include outdoor cafés, fountains, sculpture, or a bandshell for performances. These attractions don't need to be big to make the square a success. In fact, some of the best civic squares have numerous small attractions such as a vendor cart or playground that, when put together, draw people throughout the day. We often use the idea of "The Power of Ten" to set goals for destinations within a square. Creating ten good places, each with ten things to do, offers a full program for a successful square. 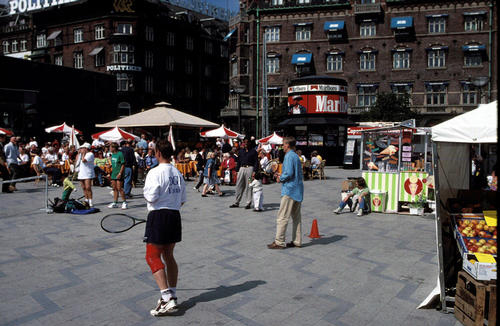 A square should feature amenities that make it comfortable for people to use. 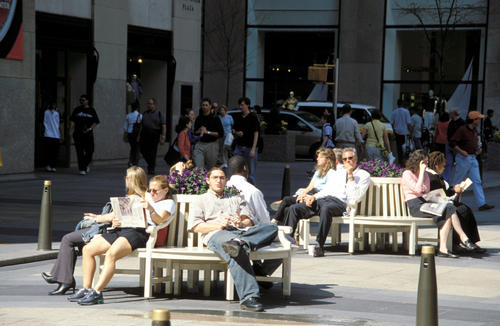 A bench or waste receptacle in just the right location can make a big difference in how people choose to use a place. Lighting can strengthen a square's identity while highlighting specific activities, entrances, or pathways. Public art can be a great magnet for children of all ages to come together. Whether temporary or permanent, a good amenity will help establish a convivial setting for social interaction. The use of a square changes during the course of the day, week, and year. To respond to these natural fluctuations, flexibility needs to be built in. Instead of a permanent stage, for example, a retractable or temporary stage could be used. Likewise, it is important to have on-site storage for movable chairs, tables, umbrellas, and games so they can be used at a moment's notice. 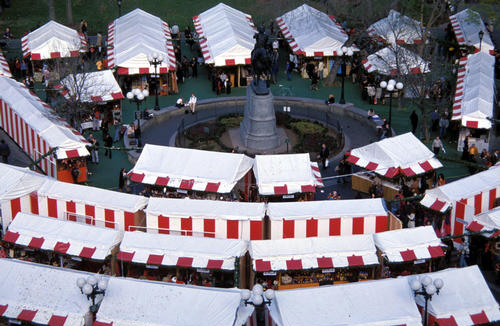 The holiday market in New York's Union Square. A successful square can't flourish with just one design or management strategy. Great squares such as Bryant Park, the plazas of Rockefeller Center, and Detroit's new Campus Martius change with the seasons. Skating rinks, outdoor cafés, markets, horticulture displays, art and sculpture help adapt our use of the space from one season to the next. 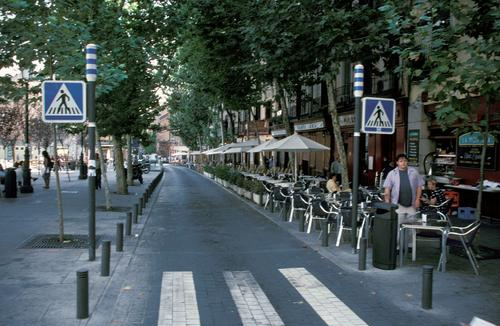 A short pedestrian crossing at Plaza Santa Ana in Madrid, Spain. To be successful, a square needs to be easy to get to. The best squares are always easily accessible by foot: Surrounding streets are narrow; crosswalks are well marked; lights are timed for pedestrians, not vehicles; traffic moves slowly; and transit stops are located nearby. A square surrounded by lanes of fast-moving traffic will be cut off from pedestrians and deprived of its most essential element: people. 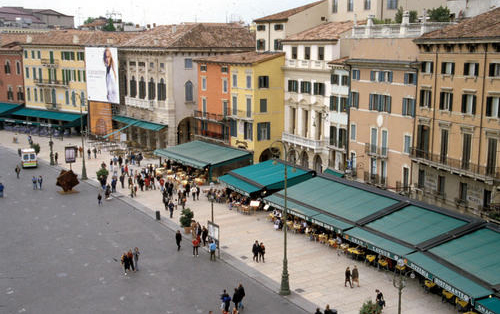 Ground floor retail rings the edge of this square in Verona, Italy. Visionary park planner Frederick Law Olmsted's idea of the "inner park" and the "outer park" is just as relevant today as it was over 100 years ago. 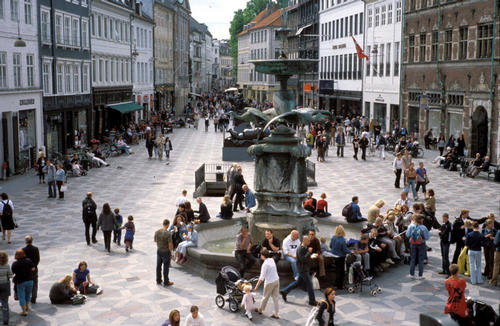 The streets and sidewalks around a square greatly affect its accessibility and use, as do the buildings that surround it. Imagine a square fronted on each side by 15-foot blank walls -- that is the worst-case scenario for the outer square. Then imagine that same square situated next to a public library: the library doors open right onto the square; people sit outside and read on the steps; maybe the children's reading room has an outdoor space right on the square, or even a bookstore and cafe. An active, welcoming outer square is essential to the well-being of the inner square. 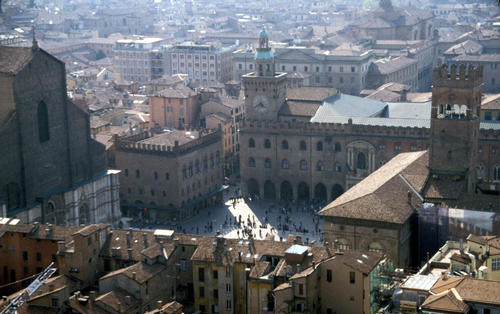 A great square reaches out into the surrounding neighborhood, like Piazza Maggiore in Bologna, Italy. Just as important as the edge of a square is the way that streets, sidewalks and ground floors of adjacent buildings lead into it. Like the tentacles of an octopus extending into the surrounding neighborhood, the influence of a good square (such as Union Square in New York) starts at least a block away. Vehicles slow down, walking becomes more enjoyable, and pedestrian traffic increases. Elements within the square are visible from a distance, and the ground floor activity of buildings entices pedestrians to move toward the square. 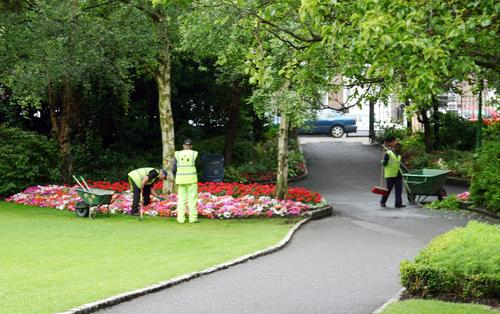 Attentive maintenance is an essential part of good management in St. Stephen's Green, Dublin. The best places are ones that people return to time and time again. The only way to achieve this is through a management plan that understands and promotes ways of keeping the square safe and lively. For example, a good manager understands existing and potential users and gears events to both types of people. Good managers become so familiar with the patterns of how people use the park that waste receptacles get emptied at just the right time and refreshment stands are open when people most want them. Good managers create a feeling of comfort and safety in a square, fixing and maintaining it so that people feel assured that someone is in charge. 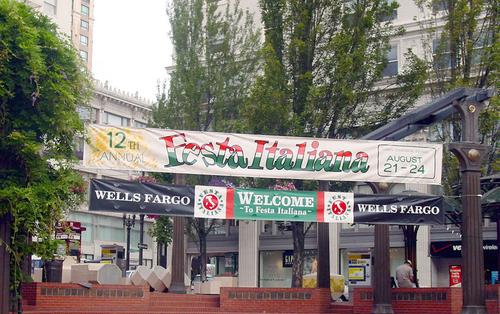 Sponsorships can help fund events like Festa Italiana in Portland's Pioneer Courthouse Square. A well-managed square is generally beyond the scope of the average city parks or public works department, which is why partnerships have been established to operate most of the best squares in the United States. These partnerships seek to supplement what the city can provide with funding from diverse sources, including--but not limited to--rent from cafés, markets or other small commercial uses on the site; taxes on adjacent properties; film shoots; and benefit fundraisers.